Dozens of Israeli soldiers invaded, on Thursday at dawn, several villages and towns in the southern West Bank district of Hebron, broke into and searched homes, and illegally confiscated a large sum of cash from one home. Media sources in Hebron said the soldiers invaded Jabal al-‘Arous area, in Yatta town, and searched the home of Tha’er Makhamra, before summoning him for interrogation at the Etzion military base and security center, north of Hebron. They added that the soldiers invaded the home of Abdullah Ed’eis, who was abducted by the army two days ago, and confiscated more than 48.000 Israeli Shekels. Abdullah is the father of Morad, 16, who was killed in January of last year after he reportedly killed a settler woman, in Otneil colony, south of Hebron. 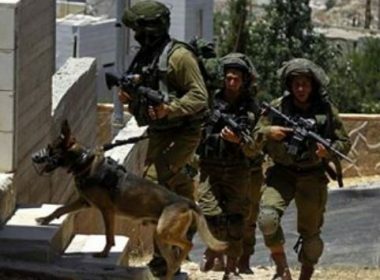 The soldiers also invaded and violently searched many homes in Abu al-’Arjan area, south of Hebron. The homes belong to Maher Shawamra, Yasser Shawamra, Riyad Shawamra, and Riyad Namoura; the soldiers claimed they were looking for weapons, but did not find any.